Who Should Consider an Online Bachelor's Degree? What Are The Most Affordable Online Bachelor's Degree Programs? What to Expect from an Online Bachelor's Degree Program? Online colleges offer what was once nearly impossible: the opportunity to earn a college degree while maintaining a full-time job. As universities across the country rush to bring their programs online, students have more distance education options than ever before. With so many choices, it’s important to find the right school for your educational goals and your budget. An online degree is more than a temporary expense: it’s an investment in your future. Unsurprisingly, many students prioritize affordability when they begin their college search. And as online education gains even greater prominence, many cost-conscious students begin by looking for the cheapest online colleges in terms of tuition costs. It’s a fair place to start the search, considering how much students save by foregoing room and board, commuting costs, and textbook fees. Critically, there is a big difference between affordable online colleges and cheap online colleges. Our list below is an attempt to separate the former from the latter. Using our new “College Affordability Score,” we have carefully calculated a list of online universities that offer robust educational opportunities and comprehensive financial aid. These colleges have a proven track record of helping online students graduate, without saddling them with punishing, long-term debt. This data can help you determine which colleges give you the best chance to earn a degree at an affordable price. WHAT IS A GOOD AFFORDABLE ONLINE COLLEGE? 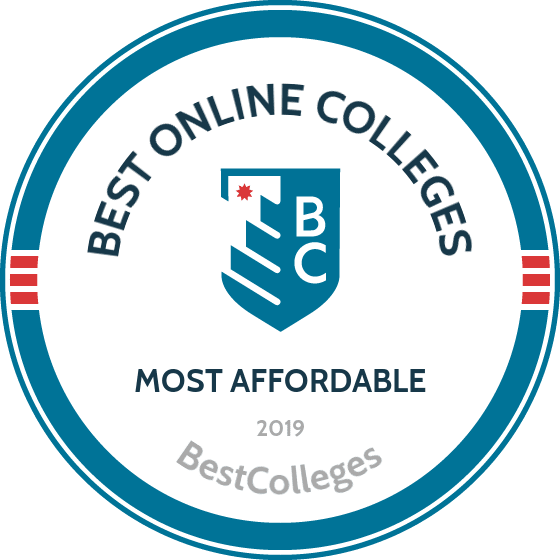 A good, affordable online college is accredited and offers high-quality resources and programs but for a lower price than their prestigious counterparts. An affordable school also offers students many options for paying for their own education. Read more here.. Some textbooks can be purchased in a digital format, which is usually much cheaper than physical textbooks. Students should also check whether the older versions of a textbook will suffice, as these editions are typically less expensive. Read more here..
College students can save money on food costs by creating and sticking to a budget, refraining from eating out, buying generic food, and cooking their own meals. On-campus meal plans are also an option and can be paid for with student loans. Read more here..
Online colleges provide the rigor and respectability of a brick-and-mortar campus while offering maximum flexibility and affordability for students who lead busy lives or live in rural areas. The ideal distance learner is passionate about furthering their education, willing to work hard, has self-discipline, understands basic technology, and is intrinsically motivated. Earning a bachelor's degree through an online college presents the same benefits as any other four-year program, but often at a lower price. In addition to higher starting salaries, those holding a four-year degree will earn more wage increases throughout their careers and advance in their careers more quickly than those without a college degree. An undergraduate education from Brigham Young University-Idaho has numerous benefits. It's one of the most affordable online colleges, and the university offers a variety of fully online undergraduate programs. Online bachelor’s degrees include applied management and web design and development. Students interested in pursuing a career in the healthcare industry have several options, including programs in public health, healthcare administration, and an RN to BSN program. The university’s online interdisciplinary studies degree enables students to develop an individualized degree plan that incorporates multiple disciplines. BYU’s bachelor programs usually require around 120 credits, and the online format allows students to take one class at a time. Online students have access to federal financial aid, pell grants, and scholarships, including financial awards for nontraditional students and parents in school. BYU admits students in the spring, summer, fall, and winter. University of Florida, located in Gainesville, provides Florida residents and students across the globe with academic opportunities, including access to 19 fully online undergraduate programs. UF’s online programs cater to a broad range of career interests, and students choose from degrees in computer science, environmental management, psychology, sociology, and more. The BA in business administration allows students to concentrate in one of eight areas, and the completely online public relations degree prepares students for careers as technical writers, media coordinators, and fundraising managers. This affordable online college offers distance learners a standard tuition rate regardless of residency. An online admissions team assists students throughout the entire application process. Students with less than 12 college credits are considered freshmen. Lower division transfers have 12-59 credits, and upper division transfers have more than 60 credits. Transfer students must have a minimum GPA of 2.0. Thomas Edison State University offers quality education. Its comprehensive tuition plan allows students to take up to 36 credits per year for an annual price instead of paying per semester. Online students have the option of paying per credit, which allows them to pursue their degree at their own pace. Online degrees include communications, sociology, liberal studies, and electronic systems engineering technology. The BS in business administration equips students with a variety of professional business skills. TESU offers several bachelor's degrees in applied science and technology, including electrical technology, energy systems technology, and nuclear engineering. Online courses take 12 weeks to complete and are delivered through the university’s online learning platform, myEdison. TESU, one of the best affordable online colleges, offers university-funded and private scholarships. Other financial aid opportunities include federal and state financial aid and military discounts for veterans and their families. The University of Central Florida, known for its affordable online college programs, offers more than 80 online degree and certificate programs, including undergraduate degrees in criminal justice, history, political science, and technical education and industry training. The university’s unique religion and cultural studies degree provides students with the opportunity to explore world religions, from ancient to contemporary traditions. UCF offers three English concentrations: creative writing, literature, and technical communication. Students with an associate degree can seamlessly transfer into the bachelor of applied science. Available tracks include health services administration and software development. Students begin the application process by choosing a major and submitting an online application. Other admissions requirements include official transcripts, ACT or SAT scores, and proficiency in a foreign language. U.S. News and World Report ranked UCF Online for providing one of the best undergraduate degree experiences. Utah State University promotes quality education through its diverse online degree offerings. Students seeking affordable online colleges have the opportunity to choose between several degrees at USU. The liberal arts degree allows transfer students to complete their degree and pursue graduate programs in areas such as law, medicine, and the social sciences. To be eligible for the liberal arts program, students must have 45 credits and a minimum GPA of 2.5. All bachelor’s programs consist of 120 credits. Courses are offered in a semester-long, 14-week term or two 7-week terms. Online students have access to numerous resources, including E-tutoring, student software discounts, and remote IT help. Utah State is among the nation’s most affordable accredited online colleges, providing students with a straightforward tuition calculator and offering several departmental and private scholarships. The University of Houston-Victoria’s online programs provide students with numerous benefits, including lower costs, less pressure, networking opportunities, and marketable skills. The online learning platform equips students with field-specific skills and teaches them how to efficiently manage time and self-motivate. Completely online degrees include communication, English, history, and psychology. The university offers several bachelor of applied arts and sciences programs, including degrees in digital gaming and simulation, networking and security, and petroleum technology. To be eligible for one of the BAAS programs students must have 24 credits of vocational or technical training or an applied arts and sciences associate degree. UHV, one of Texas’s most affordable accredited online colleges, offers several types of financial assistance, including grants, loans, and numerous agency scholarships. For admittance, freshmen students must be ranked in the top 50% of their graduating class. Transfer students must have a minimum GPA of 2.0. Florida International, located in Miami, is an affordable online college. FIU offers 12 fully-online bachelor's degrees that cover numerous career interests, including criminal justice, international relations, early childhood education, and women’s and gender studies. The university’s bachelor's in Latin American and Caribbean studies allows students to examine language and culture, governance, and migration issues. Students interested in hospitality management choose between six concentrations, which include culinary management, event management, and tourism management, this allows them to specialize in their area of interest. The online undergraduate programs are 120 credits, with 60 lower-division courses and 60 upper-division courses. Students interested in pursuing their degree from FIU submit an online application along with transcripts and ACT or SAT scores. Online students are eligible to receive financial aid, this includes private merit-based scholarships. Arizona State offers more than 140 online degrees and six start dates throughout the year. The university’s fully online undergraduate programs include art history, film, electrical engineering, and health innovation. ASU’s online bachelor’s degrees are 120 credits, and students take an average of 39 classes. Each class takes 7.5 weeks to complete, and start dates are available after each course schedule. Applicants must have a minimum SAT score of 1040-1120, depending on the date the test was taken, or an ACT score of 22 for in-state residents and a score of 24 for non-residents. Incoming freshmen must be in the top 25% of their high school class with a minimum GPA of 3.0. Transfer students must have a cumulative GPA of 3.0. ASU, one of the nation’s most affordable online colleges, offers a variety of financial aid and scholarship opportunities. Western Governors University, located in Salt Lake City, Utah, is an affordable online college that specializes in distance learning. The university offers fully online degrees through its four colleges: teachers college, college of business, college of information technology, and college of health professions. The teachers college prepares students for teacher licensure in areas such as elementary education, special education, and mathematics. Undergraduate business programs include accounting and human resource management. Students with an interest in the field of information technology choose from several majors, including data analytics, network administration, and software development. WGU offers an RN to BSN program and a BS in nursing for students residing in California, Texas, Florida, Indiana, and Utah. General admissions requirements include an online application, submission of a high school diploma or GED, official transcripts, and an interview with a WGU enrollment counselor. Several of WGU’s programs have specific admissions requirements. TU, located in Towson, Maryland, offers a fully online undergraduate degree in allied health for students with an accredited AAS associate degree. Students choose between two concentrations in administration/management or advanced respiratory therapy. The curriculum consists of 120 credits, and students can transfer up to 64 credits. Learners complete 18 credits in their chosen concentration and 18 healthcare foundation courses, with topics including evidence-based practice, research methods, and technical and professional issues in allied health. The online program emphasizes cultural competency and prepares students to work with diverse populations. Online courses are delivered through Blackboard. Towson University’s competitively priced tuition and numerous financial aid programs make it one of the most affordable online colleges in the U.S., and students have access to scholarships, need-based and TEACH grants, and loans. Financial awards include undergraduate, departmental, and private scholarships. The office of technology services provides students with educational discounts. Bellevue University’s selection of fully online undergraduate programs equips students with practical skills needed for professional advancement. Degrees include accounting, web development, business, criminal justice, mathematics, and psychology. The average online degree consists of 127 credits, including credits in general education, electives, major requirements, and the Kirkpatrick Signature Series. This approach to higher education explores the political and philosophical movements that shaped and continue to influence Western civilization. Every student takes nine credits in the series. Courses at this affordable online college involve actively engaging peers and instructors through online discussions. Students can begin their program throughout the year. Many programs have specific admissions requirements. Programs that use a cohort model require students to have 60 credits prior to beginning. Distance learners receive online tutoring and access to the writing center. This affordable online college offers numerous financial aid and scholarship programs. The school puts out more than $30 million in scholarships and grants each year. Students have access to local, state, and national scholarship opportunities and departmental awards. The university’s online undergraduate programs allow students to pursue their academic and career goals from a distance. The university offers online bachelor’s degrees from four colleges: liberal arts, nursing, arts media, and the school of public affairs. CU Online’s psychology degree has a student-to-faculty ratio of 17:1. Students receive individualized support from their professors and gain knowledge in areas such as experimental psychology and animal behavior. The RN to BSN degree is open to RNs nationwide. Other online degrees include English writing, sociology, criminal justice, and communication. Colorado State University-Fort Collins offers fully online undergraduate degrees, including a unique program in agricultural business. This bachelor's degree integrates key business topics, such as marketing, finance, and accounting with agricultural knowledge. The curriculum familiarizes students with agricultural and resource economics and agricultural business management. Other online degrees include fire and emergency service administration, horticulture, and human development and family studies. Online coursework is delivered through Canvas, and professors rely on video, audio, and text to teach course material. Students complete 120 credits to earn their online bachelor’s degree. CSU provides its students an affordable online college experience. Distance learners receive the same tuition rates, regardless of residency. Students have access to federal financial aid, scholarships, and military discounts. Students interested in attending CSU online complete an online application and follow program-specific application guidelines. Colorado State University-Global Campus, created in 2007, is an online state university. It's one of the top affordable online colleges. Earning a bachelor’s degree from CSU-Global increases employment opportunities and earning potential. Undergraduate programs include accounting, project management, healthcare administration and management, and human resource management. The applied social sciences degree completion program allows students to gain a variety of skills that are necessary for careers and advanced education in the field. Students must have at least 12 transferable credits with a GPA of 2.3. Students without prior college credit must complete general education courses through the university’s First-Time Freshman Cohort program before pursuing their degree. The school also offers Graduate studies and certificates and specializations. Appalachian State University, located in Boone, North Carolina, helps self-motivated students pursue their career aspirations by offering several degree completion programs. Online offerings include child development, social work, middle grades education, and elementary education. This affordable online college offers a unique career and technical education degree that allows students to choose from several concentrations that align with their interests. Students must have at least 30 transferable credits and meet the university’s general education requirement. Students transferring from a North Carolina community college fulfill the requirement with their core diploma, AA degree, or AS degree. Students from an out-of-state community college use their AA degree or AS degree to fulfill the requirement. Learners from a state four-year university transfer their general education courses. National Louis University, one of the best affordable colleges online, provides Chicago residents and students around the world access to several completely online bachelor’s degrees. Programs include applied communications, criminal justice, human services, and management information systems. The health care leadership program's long term care concentration prepares students for national licensure. The human service degree equips students with skills in crisis intervention, program evaluation, and interviewing techniques. The business management degree provides students with a foundation in business principles and offers several concentrations, such as aging studies, entrepreneurship, and urban and policy studies. Application requirements vary depending on student status, and the university offers unique admission paths for first-time freshmen, veterans, and transfer students. The university offers six master's program and a doctorate program in higher education leadership. Washington State University’s online bachelor’s programs emphasize student involvement and academic support. Online students engage in online discussions with peers and instructors. Virtual mentors assist students throughout their program, and students enrolled in lab courses automatically receive materials in the mail. WSU Global Campus delivers coursework through Blackboard, and online students have access to the university’s bookstore and library. Undergraduate degrees offered through WSU’s affordable online college prepare students for entry-level positions and graduate studies. Programs include data analytics, human development, and management information systems. All twelve of WSU’s online programs include university common requirements, such as quantitative reasoning and communication. Transfer students with an associate degree usually satisfy common requirements and receive junior standing upon admission. Online student services include access to an academic adviser, 24/7 tech support, and free online tutoring. Nebraska Methodist College is one of the leaders in nursing education among affordable accredited online colleges. Its fully online RN to BSN degree emphasizes community-oriented practical skills training, and students can complete the degree in seven semesters or less. Full-time and part-time enrollment is available. The 126-credit curriculum includes topics in community health nursing, pathophysiology, and lifespan psychology. The degree incorporates the university’s educated citizen core curriculum, and students develop skills in self-reflection, communication, and professional competency. NMC accepts students on a rolling basis. Students begin the program in August, January, or May. Admissions criteria include unencumbered RN licensure, an associate degree or equivalent diploma from an accredited nursing program with a minimum GPA of 2.5, and the applicant’s ability to meet program technical standards. Non-Nebraska residents must ensure that their state participates in the online learning reciprocity agreements. UHD offers several fully online bachelor's degree completion programs from four colleges: business, humanities, public service, and university college. Eligible students have earned general education credits from a previous university and begin their program as upper-level students. Transfer students must have a minimum GPA of 2.0 and be in good academic standing with their previous institution. UHD’s online degrees allow students to pursue a variety of careers, including healthcare administration, negotiation, and mediation. The BAAS in applied administration prepares students for leadership roles in organizations and offers a concentration in safety management. Other programs include criminal justice, professional writing, and insurance and risk management. Online courses are powered by Blackboard. Students access assignments and engage with professors and peers through the learning platform. While online non-Texas students pay out-of-state tuition, the university’s numerous financial aid and scholarship opportunities make it one of the most affordable online colleges. An undergraduate degree from the University of Minnesota, an affordable online college, provides a flexible alternative to traditional face-to-face education. Online students choose from several bachelor’s programs, including applied health and sport and recreation management. The university’s unique bachelor’s degree in tribal administration and governance integrates business with federal Indian law and policy courses. This program teaches strategic management skills, and coursework prepares students to work for tribes and related entities. The versatile bachelor of multidisciplinary studies is ideal for working adults who wish to finish their undergraduate degree. Eligible students must have 50 prior credits with a at least a 2.5 GPA. Graduates pursue careers in areas such as project management, network administration, and systems engineering. All of the university’s online bachelor’s degrees consist of 120 credits. Some programs admit a limited number of students. Park University, located in Parkville, Missouri, is one of the region’s most affordable accredited online colleges with many scholarship opportunities. Park University offers more than 24 fully online bachelor’s degrees, including degrees in business administration, graphic design, journalism, and social psychology. Many of the online programs are available as minors. The management program allows students to choose from eight concentrations, such as health care or marketing, and students gain skills in leadership and strategic management. Each bachelor’s program includes liberal education requirements that emphasize social well-being, creativity, and scientific inquiry. Bachelor of science degrees consist of 120 credits, and students complete a minimum of 45 upper division credits and 37 liberal education credits. Bachelor of arts degrees are 122 credits and have similar upper division and liberal education credit requirements. Northeastern University Global Network offers a variety of online undergraduate programs that cater to the needs of the busy professional. Degrees include finance, accounting management, and professional communication. The bachelor's in liberal studies allows students to customize their degree to fit their unique professional interests. This versatile degree is 120 credits, and students complete coursework in general education and liberal studies foundations. Students develop a major that consists of 33 credits and finish the degree with a capstone research project. Online coursework is delivered through Blackboard, and students complete asynchronous weekly assignments. Northeastern offers an online class demo to familiarize students with online learning. Students interested in applying to one of Northeastern’s affordable online college programs submit an online application and official transcripts. Students are not charged an application fee; no test scores are required. Start dates are offered throughout the year. Mizzou offers several fully online bachelor’s degree completion programs that allow students to finish earning their undergraduate degree. Mizzou Online, one of the top affordable online colleges, enrolls students from 50 states and 49 countries. Graduates of community colleges, veterans, and military service members and their dependents receive a 10% reduction on tuition. Online degrees include hospitality management, radiography, and early childhood education in a mobile society. Each program is 120 credits, and each have different transfer-credit requirements. A business administration student needs 66 transfer credits, while an educational studies student needs 59 transfer credits. The university’s general studies degree provides students with an academic foundation and does not require foreign language coursework. Students are admitted to the program year-round, and self-paced courses allow students up to six months to finish. Located in Fort Pierce, Florida, Indian River State College’s tuition rates, per credit, are roughly 40% less than Florida public universities. IRSC, one of the state’s most affordable online colleges, offers seven fully online bachelor’s degree completion programs. From business administration to IT management and cybersecurity, these online programs prepare students for career success in some of the fastest growing fields. Eligible applicants have an associate degree or equivalent academic experience, and most of the degrees are 60 credits. Other general admissions requirements include two years of high school foreign language or second level foreign language in college. Program-specific requirements include core coursework in relevant areas such as database management and web programming for computer IT students. Each program includes a capstone project that students complete near the end of their degree. Online courses are taught through Blackboard, and students have access to online tutoring, virtual campus information sessions, and an online student success guide. Central Washington University offers 10 fully online bachelor’s degree completion programs in areas such as aviation management, professional and creative writing, and sociology. CWU’s interdisciplinary studies program allows students to develop a unique program of study, and students complete 62 credits, including courses in social science research methods and a senior portfolio project. The university’s law and justice degree prepares students for criminal justice careers and graduate studies. Law and justice students complete 32 core courses with topics in criminal procedure and social justice and 28 law and justice electives. This allows students to gain skills in a specific area, such as correctional counseling or family law. Students must possess an associate degree or equivalent credit to be eligible for admission. This affordable online college does not charge online students out-of-state tuition. Online bachelor's degrees -- and their curriculums -- are incredibly varied. While some schools offer classes asynchronously to give students more control over their schedules, others require students to log-in at specific times. Schools are adding online degrees to their program list each year, and there is no shortage of options for students to complete a degree. HOW LONG DOES IT TAKE TO GET AN ONLINE BACHELOR'S DEGREE? The length of time to complete a degree at affordable online colleges is affected by many different factors. Some schools offer accelerated formats with shorter terms, while others stick to the traditional 16-week semester schedule. Cohort learning, a style of education where students take the same classes and finish the program together, is a popular style of teaching at some colleges. Other programs allow self-paced learning, making it possible for individual learners to complete the degree at a pace that suits their life. Another common option with online bachelor's degrees is the completion path, which allows those with associate degrees to complete their baccalaureate learning in two years. Students who pursue a standard bachelor's degree full-time via online learning can expect to finish in approximately four years. The majority of programs require 120 to 128 credit hours to graduate, which is equivalent to 15-16 credits per term for a full-time student. Distance learning is often an affordable option for students who may not otherwise be able to study on campus, yet students also need to do their research before committing to an institution. Finding a school that is regionally accredited and well-regarded within both academic and professional circles can make a significant difference in terms of salary and employment outcomes. Once a student enrolls in online learning, the next step is to choose a major. Below are some of the most recent popular degree choices. Whether to attend a college in your home state or out-of-state is often determined by three factors: availability of academic program, accessibility to services, and cost. If a public school in your home state doesn't offer your desired degree path, you may need to look at schools elsewhere. Some students may also want to take advantage of resources and services offered to campus-based learners (e.g. career counseling, libraries, student clubs) without committing to being on campus multiple times per week. In terms of cost, many of the cheapest online colleges offer discounted rates or allow out-of-state distance learners to pay the same tuition as resident students, making it an attractive option for cost-conscious learners. Other schools, however, charge out-of-state online learning rates. Before enrolling in any online program, students must check the school's policies on State Authorization. This rule, enforced by the U.S. Department of Education, requires institutions to receive individual state approval to offer degrees in that state. These requirements are also tied to the school's ability to receive Title IV Federal student aid, and students who attend schools that aren't approved won't be able to take advantage of any federal funding assistance. Accreditation is an important factor to consider when pursuing an online education. Enrolling in even the cheapest online college, if not properly accredited, can make for a costly mistake. Colleges that aren't properly accredited can pose significant issues for students attempting to transfer credits, gain licensure and/or certification, or even land a job. Before committing to any institution, it's crucial for distance learners to do their research and understand the type of accreditation their prospective school has earned. The two main types of school-wide accreditation are regional and national. Regionally accredited schools are typically considered to be more prestigious and trustworthy because they undergo a long and rigorous evaluation by educational authorities. These accrediting bodies research a school's learning opportunities, student services, faculty qualifications, and more before providing regional accreditation. All regional accrediting bodies also must be recognized by the U.S. Department of Education (DOE) and the Council for Higher Education Accreditation (CHEA). The DOE is a federal government agency tasked with setting and enforcing standards for all public institutions and any private institutions that receive federal funding. CHEA is an organization of more than 3,000 colleges and universities and is recognized by the DOE as an authoritative body. National accreditation is provided by agencies approved by the CHEA and involves a less comprehensive evaluation. They typically focus on a specific type of educational service, such as career and vocational training or distance learning. Because standards are less rigid, students who attend nationally accredited schools may have trouble transferring credits to a regionally accredited institution. The other type of accreditation is program-specific, and includes agencies such as the Association to Advance Collegiate Schools of Business, the American Occupational Therapy Association, Accreditation Council for Occupational Therapy Education, or the American Psychological Association, Commission on Accreditation. Students who want to learn more about accrediting bodies can find a full list of all accredited schools through the Department of Education's website or the Council for Higher Education's website. Deciding on a major is an important step for student, and should account for their personal interests and the likelihood of employment upon graduation. The table below highlights unemployment rates for a number of different degree paths, but students should note that even industries with higher unemployment rates are growing. Deciding on the best degree path includes weighing interests, talents, salary potential, and the likelihood of happiness and success in a chosen career. While students should not select a degree that they don't enjoy, earning potential is also something students might take into consideration. Students who need help financing their degree have many places to turn for assistance. The first step is to complete the Free Application for Federal Student Aid (FAFSA), which determines a student's eligibility for federal scholarships, grants, loans, and work study opportunities. Other options include looking for field-specific scholarships or those based on need and/or merit. Tuition rates are one of the most obvious factors to consider as you weigh the total cost of a bachelor's program, but sticker price is not the only financial burden students bear. In addition to tuition and fees, students must also account for other common costs, such as living expenses, textbooks, transportation, housing, and interest rates accrued on any student loans. College Board breaks down the average cost for different types of four-year schools below. College may be expensive, but there are ways to make it more affordable, save money, and even graduate debt free. The strategies highlighted below can save students tens of thousands of dollars over the course of their college career. College Board found that tuition and fees for in-district community colleges was $3,660 during the 2017-2018 school year, compared to $10,230 for resident state school tuition and $35,830 to attend a private university. Completing the first two years of a degree at a community college can have significant savings. Lots of colleges and universities count Advanced Placement and International Baccalaureate coursework toward college credits, and students at public high schools only need to pay a small exam fee to take the associated AP/IB tests. Rather than charging for individual credits, many four-year institutions set a flat tuition rate for students taking between 12 and 18 credits per term. By taking the maximum number, students pay less and graduate more quickly. Put down the phone and think twice about ordering that delivery pizza. Students who live in reasonable housing with roommates, cook meals, bring lunch to campus, and adhere to a strict (but fair) budget can save thousands of dollars over the course of their college career. The U.S. Department of Education provides an estimated $46 billion annually in grants and scholarships, or approximately $8,390 per student. Funds are given on a rolling basis, so students should complete their FAFSA as quickly as possible to make the most out of federal aid. Today, the average American student and his/her family typically don't have extra funds on hand to pay for college out-of-pocket -- especially considering the ever-rising cost of college. In many cases, financial aid is a great way for students and their families to afford a bachelor's degree. By starting early and understanding the options, students can attain a reputable bachelor's degree without breaking the bank. Grants and scholarships are the preferred form of financial aid for many students, as they do not have to be paid back to the government agency or private foundation distributing them. Although federal loans do need to be repaid once a student leaves or graduates school, the federal government offers a range of subsidized and unsubsidized to help students bridge the gap between personal funds and other financial aid sources. Education tax credits, such as the American Opportunity Tax Credit or the Lifetime Learning Credit, allows students to claim educational expenses on their tax returns, thereby reducing the overall tax burden or, in some cases, providing a refund if the cost of education reduces their taxes to less than zero. FWS allows individuals to work on campus, at governmental agencies, or at some nonprofit organizations in exchange for federal funds. The amount available each year is determined by how many hours the student can work, the FWS budget at their school, and their existing funding resources. Who Can Apply: Female computer engineering students enrolled in their final year of undergraduate study, with GPAs of 3.5 or higher. Who Can Apply: Available to any student with a disability who is pursuing undergraduate study at an accredited institution in a field related to health and/or disabilities. Who Can Apply: Undergraduate students enrolled at an accredited college or university who are the first in their family to attain postsecondary education.